Hilda Agnes Martin was born on October 7th, 1918, in Walpole, Massachusetts, one of eight children of John Patrick Martin from Donegal, Ireland, and Mary Jane Cleary from Halifax, Nova Scotia, Canada. Hilda graduated from Framingham High School in 1936, and later trained to be a Registered Nurse at Framingham Union Hospital. She served several years in the United States Navy as a nurse. She often told the story that, leaving the Navy, she knew she wanted religious life. She visited several convents in the Washington DC area, but nothing seemed to “fit”. Coming home to Massachusetts, she was driving one day and noticed the sign “Marist Missionary Sisters” on a house on Central Street. She decided to stop and find out what these Sisters were all about. 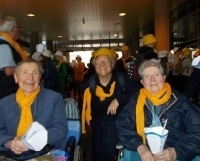 Sr. Mary Hager answered the door and made her welcome and Hilda soon decided that this was the congregation for her! She often chuckled about how she had searched far away and then came home to find these Sisters that she had never heard about. 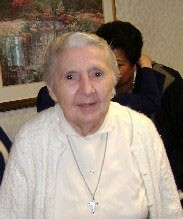 Hilda entered the Marist Missionary Sisters in Lowell Massachusetts on February 11th 1953, and took the name “Sr. Mary John Patrick” at her reception into the novitiate in Bedford. She made her first vows there on August 15th 1955. In March 1957, Sr. Mary John Patrick arrived in the Solomon Islands, where she was to serve for the greater part of the next 40 years. She began as a nurse in the Takwa Clinic in Malaita, then in 1966 came to Honiara where she served as a Regional Councilor as well as Matron of Tetere Leprosarium. After a home visit and “Second Novitiate” in the USA in 1969, Sister was called to serve as a nurse at the tuberculosis hospital in Killara, Australia for five years. Afterwards she did a midwifery course and obtained her certificate in 1975. From 1979-81 Sr. M John Patrick was in the USA and prepared for a change in her ministry by doing theological studies at Pope John XXIII Seminary and participating in Clinical Pastoral Education. She also served as Mission Bursar during those years. 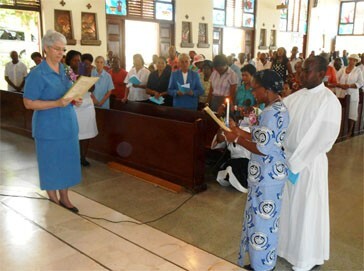 When Sister returned to her beloved Solomon Islands in 1981, she became a hospital chaplain in Honiara. 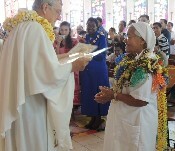 From 1988-90 she also served as the Sector Coordinator for the Sisters in the Solomons. 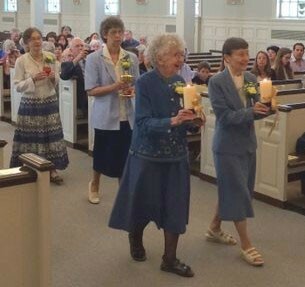 Always known as a hard-working, generous and caring person, Sr. Mary John Patrick was called several times to “help out” in different areas of the congregation where there was a need. In 1990 she went to Bangladesh for three months to assist at the clinic at Tuital. Later that same year she went to Tonga where she worked at the clinic at Ma’ufanga, and remained there until December 1992. 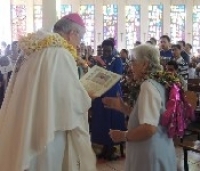 In 1993 Sr. John Patrick participated in a Marist Renewal program in Auckland, New Zealand, before returning once again to the Solomon Islands. By this time she was no longer working as a nurse, but continued to visit the handicapped and victims of leprosy, as well as the sick in the hospital. After a home visit to the USA in 1997, Sister returned to Honiara once again, where she became involved with prison ministry, as well as serving as the Sector Financial Administrator. 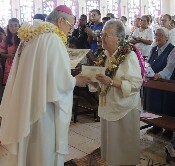 Finally in 2000, Sr. Mary John Patrick prepared to leave the Solomon Islands for the last time, and transfer back to the North American Province. Archbishop Adrian Smith, looking back at Sister’s long years of willing service to the sick and the poor called her the “Mother Teresa of the Solomons”. Back in the USA, Sister “JP”, as she was known, was far from finished her years of service. She helped with the care of sisters who were ill, visited Maristhill Nursing Home, and each year served for two weeks as a volunteer at the Marist Brothers’ Summer Camp in New Hampshire. In 2005, Sister once again set out for a short-term assignment to be of assistance overseas – this time in Pago Pago, American Samoa. Unfortunately, she fell and fractured her hip, and had to return to the States sooner than expected. Back in Waltham, Sister’s health gradually deteriorated, and in October 2011 she was transferred to Bethany Health Care Center in Framingham, where she passed away peacefully early in the morning of January 20th, 2014, at the age of 95. Her one surviving sister, Kathleen Bowman, and several other family members attended the funeral. Sisters from all over the world wrote to tell their fond memories of Sr. Mary John Patrick. At the cemetery, it was a bright but cold New England day, with freshly fallen snow covering the graves. Two Navy men in uniform were there to honor her military service so many years ago. After the religious ceremony, they played “Taps” on the bugle, then ceremoniously folded the flag on her coffin and gave it to her sister, Kathleen.